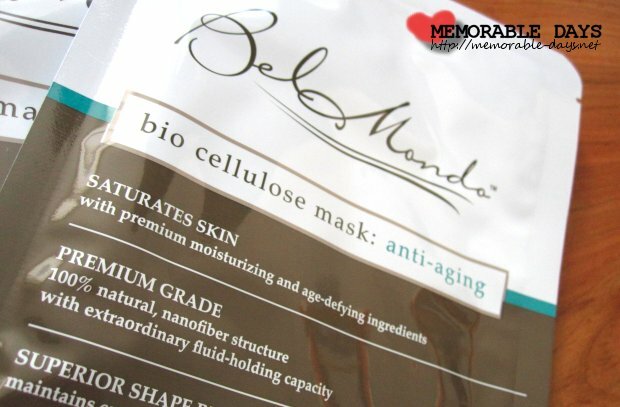 Bel Mondo: Bio Cellulose Mask - Anti-Aging Review | Memorable Days : Beauty Blog - Korean Beauty, European, American Product Reviews. 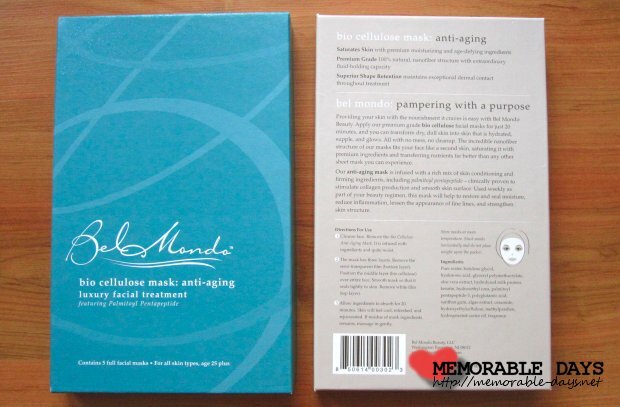 Do you remember my previous Bel Mondo bio cellulose mask review? Click here if you've missed it. They also mentioned Memorable Days on their website, Belmondobeauty.com, so check it out if you haven't seen it yet. In my previous blogpost I mentioned that Bel Mondo had contacted me to review their masks. 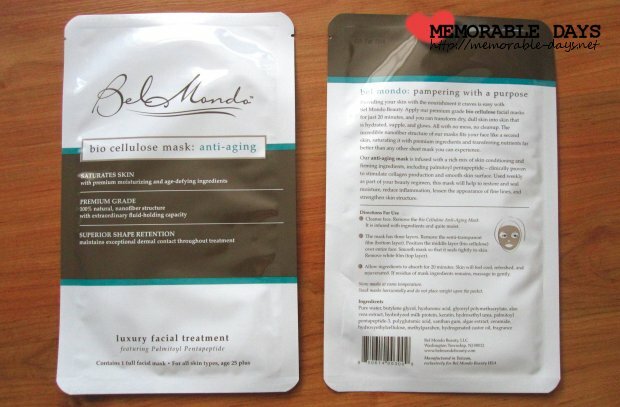 The mask that I'm reviewing in this blogpost is one of them and it's called the bio cellulose mask: anti-aging. These are NOT the same as paper masks! I've been using this anti-aging mask for 5 weeks and I'm going to review it below, so keep on reading if you're interested ;). The Anti Aging mask is ideal for ages 25 and above, who want help in repairing skin that has lost firmness and moisture and who seek to lessen the appearance of wrinkles. This mask is appropriate for all skin types, and delivers multiple skin care benefits. 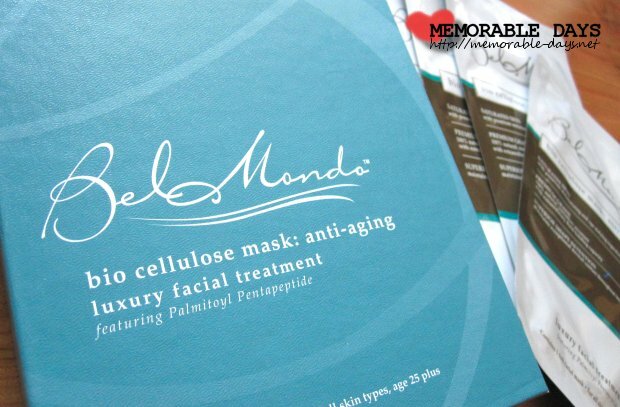 The bio cellulose mask can be purchased at Bel Mondo Beauty. The price of a single mask is $22.- and it also comes in a box of 5 which costs $90.- ($18 per mask). Quite expensive huh? The normal price range for bio cellulose masks is around $10-$20 per mask. The masks from Bel Mondo Beauty comes in a carton box. The cover is blue with the brand name and the type of mask on it. This box contains 5 anti-aging masks. The size of the packaging is extremely large. It's almost as big as a A4 paper and the size is the same as the skin lightener mask, click here to check out the size. At the back of the box you can see a description of the mask, a list of ingredients and a short explanation about how to use the masks. The mask was soaked with a lot of serum when I grabbed the mask out. I applied the rest of the serum that was left in the packaging on my neck and hands. It looked like this (see picture below) when I grabbed it out of the packaging. The mask has a great fitting and it's just great for my face, not too big, not too small. It's great that it also covers the eyes. Once I opened the lid of the mask I could smell the lovely fresh scent. It has a light fresh floral scent which is not overwhelming. The mask is translucent, stretchy and gelatinous. At first I thought it'd be fragile and tear easily, but it turned out to be an incredibly strong yet flexible film. Thin but strong. Cleanse face. Open the packaging and get the mask out. It is infused with ingredients and is very moist (see picture below), the serum drips so it's advisable to put something under it. The mask has three layers. Remove the semi-transparent film. Position the middle layer (the bio cellulose mask) over your entire face. 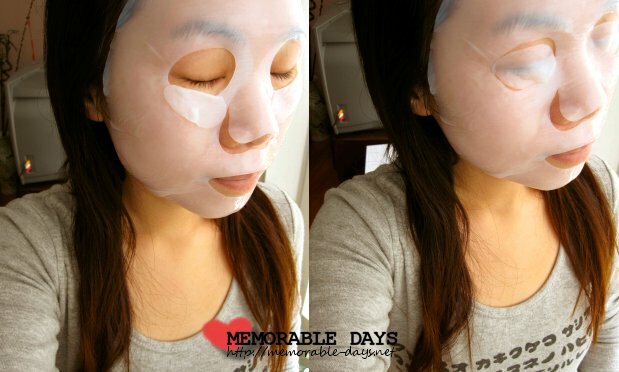 Smooth mask so that it seals tightly to the skin. Remove the white film. Allow ingredients to absorb for 20 minutes. The skin will feel cool, refreshed and rejuvenated. If residue of mask ingredients remains, massage in gently. Pure water, butylene glycol, hyaluronic acid, glyceryl polymethacrylate, aloe vera extract, hydrolyzed milk protein, keratin, hydroxethyl urea, palmitoyl pentapeptide-3, polyglutamic acid, xanthan gum, algae extract, ceramide, hydroxyethylcellulose, methylparaben, hydrogenated castor oil, fragrance. Read more about the ingredients on their website: ingredients page. Even though I'm not 25 or above I just wanted to try this mask out, because my skin was feeling a bit tired lately, mostly because I slept too late. After the first time usage, my skin felt less tired, moist and refreshed. The lovely fresh scent and the high water-retention is what I like the most about this mask. I highly recommend this mask for the night before or just a few hours before a big event. No dry spots on my face could be seen after usage, it really gave my skin a boost. Also, I like the material of the mask, it's strong and it feels comfortable. I almost fell asleep while I had the mask on xD. The only downside of this product is the price... yes, again... the high price. However, I'm sure that I will purchase this mask in the future since I am very satisfied with this mask. I can't wait to see what other innovative products are coming from Bel Mondo Beauty. This mask is for ages 25 and above...does that mean you shouldn't use anti-aging products until you're 25? It depends.. some people are starting to get wrinkles during their 20s, so those people should start using it.. but if you don't have it, there is no use to use it..